Walking through the hallways of the old Knoxville High School brings back memories for any older person who went to high school anywhere. The large facility at 101 East Fifth Avenue has four buildings and is being converted for senior living. Dover spoke briefly as did Knox Heritage’s Kim Trent and Kevin Murphey. Trent recognized the many members and board of Knox Heritage and noted the organization’s work with Dover on several other restoration projects. “We really need some more ’gray‘ here,” she said of downtown and the growing number of younger people moving to the revitalized city. Old Knox High School sits just one block north of the Old City on North Broadway and East Fifth. Three floors of the main building are being renovated. Some of the former classrooms show indications of where the blackboards were and a large safe from the original school now graces one of the first rooms on the main floor. Visitors could see how the historic windows are being replaced or recovered, how the original woodwork has been revealed from under 8 to 10 coats of paint, and note several plaques that will remain honoring former students, principals, and city officials who authorized the 1910 construction. Old Knoxville High School was a “city” school that went to county ownership when Knoxville joined the Knox County School System. The county transferred ownership to the city which put the building up for bids and Dover took ownership. The developer has pledged to keep and maintain the “Doughboy” statue in front of the building which honors World War I soldiers. He told the visitors that displays about the history of the school will be placed as the Knoxville High School Alumni Association has preserved much of the items and the building will be open to the public for visits. Dover said the residents will have apartments equipped with a full kitchen and laundry. The building will feature a full staff and services, security, a restaurant and lounge, a fitness center, an activities director, an interactive kitchen and even an art studio in the attic where the school’s indoor rifle range was located. “Each apartment is a little different,” he said because each classroom was different from the others. “Preserve, restore and repurpose in a first class manner,” Dover said of his various projects in the Knoxville area. 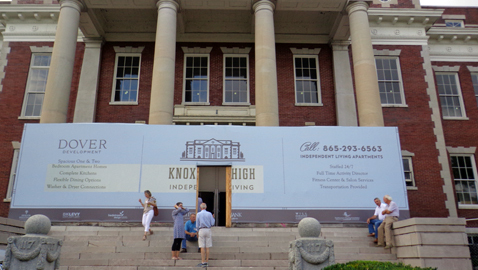 The $15 million dollar restoration of the Old Knoxville High School is but one of the projects underway by Dover. Dover Development is also working to repurpose the former Tennessee Supreme Court Building, The Farragut Hotel, the Pryor Brown Garage, and South High School. Completed projects include Northshore Senior Living, Oakwood Senior Living, the Alexandria Inn in Oak Ridge, and River Oaks, Lakewood Place and the Carmichael Inn in Loudon County. Knox Heritage hosts “Behind the Scenes Tours” for its members each spring and fall to projects being restored in our area. Founded in 1974 the nonprofit organization is a part of the East Tennessee Preservation Alliance that serves 16 counties in the Knoxville region.